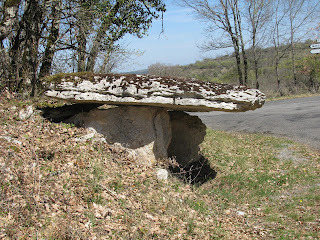 I spent most of the day Saturday on a quest for dolmens. My French road atlas shows many scattered throughout my area...the Lot and the Aveyron. I decided to make it my mission to find as many as I could. Which was not always easy. While the road atlas showed symbols of each dolmen site, it took my Michelin map to actually show me the little backroads that access them. So, armed with two maps and my camera, my quest began. 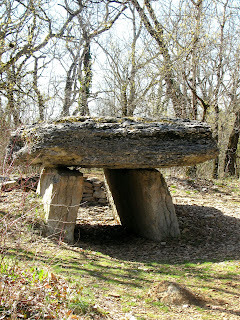 Dolmens are stone structures erected during the Neolithic age, about 4000 years ago by an unknown people. My reasearch (Wikipedia..how did we ever exist without it??) 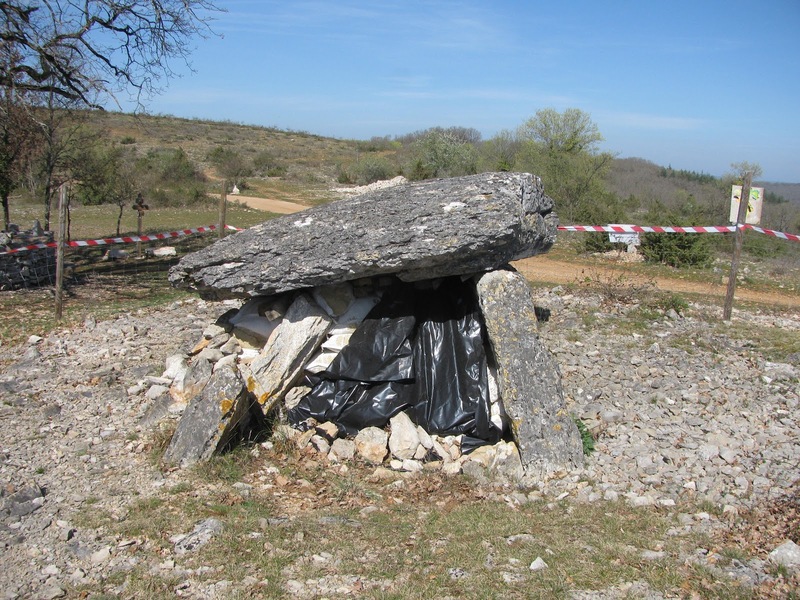 tells me that there are over 10,000 of these mysterious stone structures all over Europe. There are also dolmens in Asia and the Middle East. They are commonly thought to be some type of burial structure, but while human remains and artefacts have been found near dolmens and dated to the same period of time, there is no certainty that they are connected. 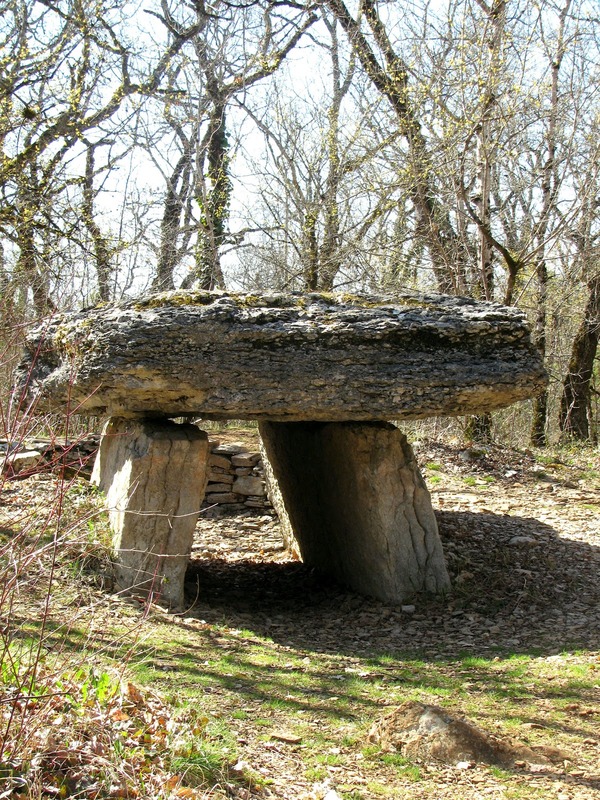 A dolmen usually has two or three upright stones, topped by one or two large, flat stones. It's believed they were orignally covered with dirt creating a burial mound, but after 4000 years, the soil as eroded away leaving just the standing stones. 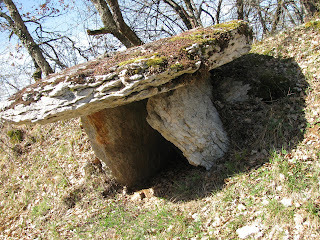 The first dolmen I found down a rocky dirt road was a bit of a disappointment. As you can see, it's leaning dangerously and by order of the mairie of Grealou, it has been packed with bags of cement to keep people (like me!) out of it. I couldn't resist getting inside and taking a self-photo! 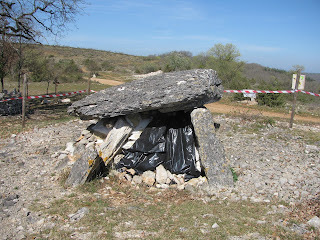 More about my dolmen adventure tomorrow!